Looking back at the fractured past of The Punisher’s most persistent foe. Most of The Punisher’s enemies, for obvious reasons, don’t return to fight him again. However, a big exception to this rule has been Billy Russo, AKA the man called Jigsaw, who easily ranks among Frank Castle's most persistent and deadly comic book enemies. Jigsaw, created by Len Wein and Ross Andru, debuted in 1976's AMAZING SPIDER-MAN #161 - #162. We don't actually see the villain in the first issue, but he's doing his best to frame Punisher for murder. 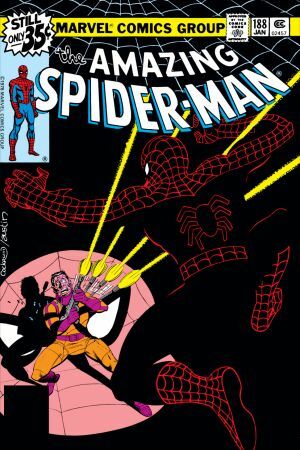 As it happened, both Spider-Man and Nightcrawler – who had yet to meet at this point – investigating the attempted shooting, but fighting one another. Eventually the trio teamed up and finally came face to scarred-face with Jigsaw! While using Spidey as bait for Punisher, he gave a quick explanation of his scarred visage, noting that Castle had tossed him through a plate glass window while wiping out a mafia family. 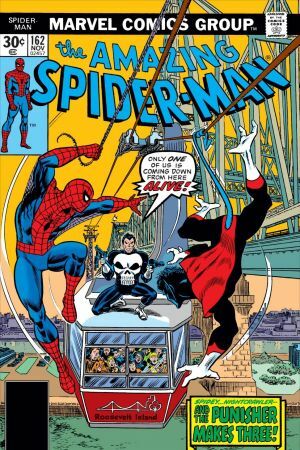 Not too long after, Jigsaw and Spider-Man would face off once more -- this time without the involvement of the Punisher, in AMAZING SPIDER-MAN #188. In 1986, during the Punisher's first limited series, our anti-hero found himself in Ryker's, having been arrested after going nuts and using ferocious tactics on the most nominal of criminals. Inside, he realized that Jigsaw had drugged him and went to exact his vengeance, but ran into a mix of cons and guards. Later, after Punisher broke out, Jigsaw got brainwashed and put on a Castle hit squad, but eventually remembers who he is. During PUNISHER #35-40 from 1990, a villain called Rev springs Jigsaw from the clink, but he runs into Frank almost immediately. With their plans foiled, Rev and Jigsaw ran away to a secluded locale where the former used his powers to heal the latter's face only to have Punisher ruin it with a bullet. Though resurrected by Rev and his demonic partner-in-crime Belasco, Jigsaw still wound up with a cut-up face and another stint in the clink. We finally learned more about the genesis of Punisher and Jigsaw's mutual hatred in 1994's PUNISHER: YEAR ONE. The good-looking young hitman dubbed "Billy the Beaut" Russo had been hired to kill Castle after his family had been killed in a mob hit that went sideways. Frank survived, tracked Billy down, killed all of his associates and left him alive in his torn-up form as a message for the rest of the underworld. Frank Castle appeared to be put to death when his 1995 THE PUNISHER series launched. The news drove Billy crazier to the point where he donned his own version of Frank's costume and went on a rampage. 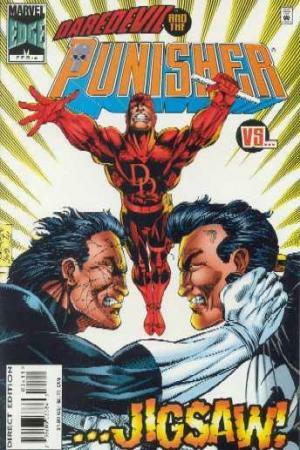 When Punisher revealed himself, his enemy was actually happy, but eventually fell to the combined might of Punisher and Daredevil. Billy attempted to get back at him later in the series by joining forces with other mobsters to take on the mafia family Castle worked for at the time! That earned Jigsaw another bullet to the head that didn't kill him. Since then, Jigsaw's gone up against Daredevil and Black Widow in DAREDEVIL #64, sprung from The Raft by Electro's attack in the first NEW AVENGERS arc and teamed-up with The Hood on a number of occasions, beginning in NEW AVENGERS #35. He would return to tormenting Castle in PUNISHER: WAR JOURNAL #18 - #23, teaming with the Wrecking Crew, before teaming up with another disfigured killer in PUNISHER: IN THE BLOOD. Most recently, Jigsaw appeared in the Search For Tony Stark story in INVINCIBLE IRON MAN #597, as well as in issues of PUNISHER and MARVEL KNIGHTS. Steve Lightfoot goes into SPOILERS on Billy's motivations and the overall approach to Season 2's villains. 'Marvel's The Punisher' Season 2 hits Netflix on January 18!